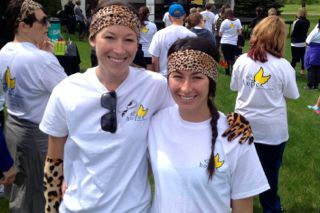 Take a closer look at some of the stories behind this year's Race for Recovery, especially that of 28-year old Lisa Helgason, who convinced 18 co-workers, family members and friends to don leopard-print gear as they walked and ran the Race. Helgason is currently battling adenoid cystic carcinoma. She was diagnosed with the rare form of cancer in March, just one week after she got married. You can also see this year's top individual fund-raisers and a tribute to one of HOPE's founding members in our Summer Newsletter 2014.pdf (2.65 mb).